No wordcount widgets available on the NaNoWriMo site as yet, but on day 8, I'm just ahead of the gray line (thanks to some quality writing time over the weekend). I hope I can keep the momentum going. Goodness! That is a lot of writing. I hope you are finding it fruitful! 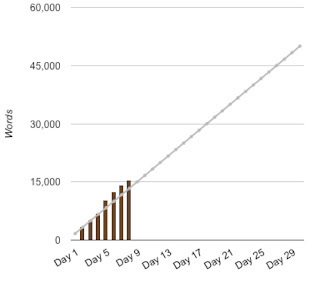 It's been going well this year--writing without a preconceived plot seems to help. A big change from my YA novels of the past two years, where plot and action drive everything else.